All India Bar Exam (AIBE) 2019 aims to judge the ability of a lawyer to practice the profession of law in India. AIBE is conducted by the Bar Council of India on yearly basis. All those who candidates have cleared their Law degree are eligible to apply. All those candidates who qualify AIBE Exam will get Certificate of Practice by BCI. The exam will check basic know-how of law and analytical abilities of a candidate and it sets a minimum standard for admission to the practice of law. 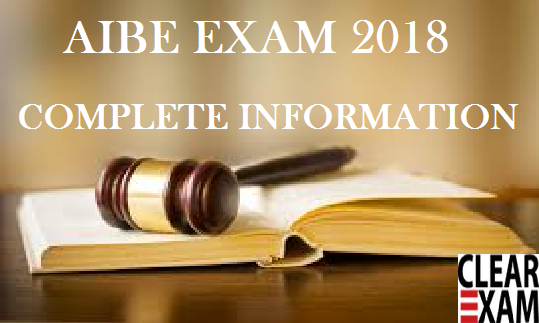 All India Bar Examination (AIBE) 2019 is scheduled to be held on December 3, 2017. All India Bar Exam (AIBE) 2019 is a standard test for judging candidates analytical skills and the basic understanding of the law. Once the lawyer clears the bar exam only then he/she is awarded the certificate of practice after obtaining which the candidate can practice law in India. The exam will be held offline in 40 cities of India. The exam will be conducted in 11 different languages. The exam is on open book examination and you must take with you the study material that you wish you refer to for answers. One is declared as having cleared the bar exam is he/she answers 40 out of 100 questions correctly. Candidates have to apply through online mode only and the registration process is currently open. One must first register on the website for AIBE 2019. The website for registration is www.allindiabarexamination.com/registration.aspx. One can log into his/her account post successful AIBE registration. The dates between which one can submit the online application form are September 1, 2017 to October 31, 2017. If one wishes to access the submitted online registration form and other details then they will be accessible and available on the login account of the candidate. AIBE 2019: How to fill the application form? All India Bar Exam (AIBE) 2019 application form is available from September 1, 2017. The first step is to add your personal and educational details and then clicking on the finish button. When you are registering you will have to be ready with documents such as advocate ID card if the same has been issued by the state bar council, the enrollment certificate, a scanned photograph, and scanned signature, and any caste or disability certificate if applicable. All documents should be self-attested. No document will be considered valid if it is not attested and the same unattested document will be rejected. Point to note is that no document should be sent offline. The documents such as scanned signature, photo, enrolment certificate, and photo id should be in jpg or jpeg format alone and the file size for these documents should be between 10 kb to 50 kb. First step: Post the first step what will happen is that your registration number and password of your account will be created and sent to you on your email id. Second Step: The second step is to click the login button on the AIBE website and providing your registration number and password. Next, you have to get a printout of the copy of the challan. You have to pay and deposit the fee only using the SBI printed challan and no other mode of paying the fee will be accepted. The fee should be deposited at any branch of the State Bank of India after 24 hours have elapsed from the time of registration. The fee for the application form of All India Bar Exam (AIBE) 2019 is Rs. 3650 for general category and Rs. 2500+60 for SC and ST category. Next, you have to wait for another 24 hours and then you have to log in to your account which you created and take a printed copy of the application form, a printed copy of your written down journal number which the bank provides and send the hard copy of the same along with requisite documents to the Bar Council Of India. Once the application process ends then you can download your admit cards from the account you made with the AIBE official website. This section should be marked in the memory as it contains important dates which have been set for the application process. You can start applying from the first date of online registration which is September 1, 2017 and continues applying till the last date of online registration which is October 31, 2017. The payment using bank challan can be made from September 2, 2017, onwards and the last date for payment of challan for online and offline application is November 4, 2017. The end date for completion of online forms is November 8, 2017, and the same is also the last date for your offline forms being received offline at BCI Delhi. The offline application forms should also reach BCI Delhi by 5 PM on November 8, 2017. The admit cards are released online for online and offline application on November 18,2017. The eligibility for this exam is that a candidate must have cleared the LLB degree ( either 3 year LLB or five-year LLB) and should be enrolled with a state bar council. Only Indian nationals are eligible. Students can rejoice because there is no maximum age limit or the maximum number of attempts for which one can appear for this exam. Also, there is no minimum marks eligibility. The exam will be held offline and will consist of 100 multiple choice questions. Total subjects covered are 20. Questions will be divided into the category I and category II. There will be 7 questions from each subject of category I and the category II subjects will consist of 23 questions in all. Category II subjects are administrative law, company law, environmental law, family law, human rights law, labor laws, torts, taxation, and public international laws. The total duration of the exam is three and a half hours and there is no negative marking. Let us look at the number of questions that would be asked from each subject. You can take books to your All India Bar Exam (AIBE) 2019 venue since the exam is an open book exam. You do not need to commit anything to memory because three and a half hours is a long enough time to look up the answers from the books. Take with you all the bare acts and go through the index so that you do not need extra time finding the answers. Point to note is that persons with disability will get 20 minutes of extra time per hour. Such students who are applying under the disability quota should have to furnish a certificate stating the same. Without this certificate, one cannot avail of the extra time benefit. All students must go through the following link http://www.barcouncilofindia.org/wp-content/uploads/2010/08/AIBEP1.pdf where you can find detailed material covering all subjects and you may take a printout of the same and take it with you to the exam hall. This is all about the syllabus, and study material and you must practice past year papers and mock tests as well. Once the exam of All India Bar Exam (AIBE) is done and students wish to find out the results then the students would have to wait for the results to be declared online on the official website of All India bar exam. You can access the results by entering your roll number and date of birth. The result will only talk about whether or not you have qualified and the students who qualify will be awarded certificate which allows a lawyer to start practicing in any court in India. The results are expected to be out by the second week of March 2019.